One day I was making something to eat. I was debating about having French Toast or scrambled eggs. I usually put milk into my egg for French Toast and I usually put milk and garlic salt or season salt in my scrambled eggs. I had decided on French Toast, but perhaps I wasn’t really firm in my decision and clearly I was not focusing on the task at hand because I stirred up the eggs and seasoned them with season salt then put the bread in it. As I was flipping the bread to coat the other side I realized my error. Sigh. 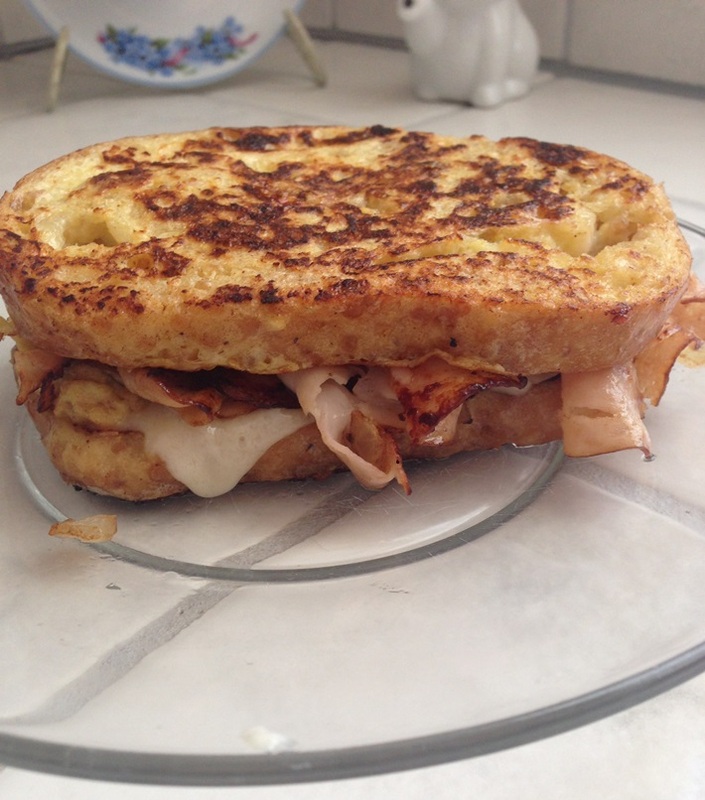 So I decided to make a grilled sandwich with the egg coated bread. It was delicious. I cooked the oddly seasoned French Toast like I would regular French Toast. I always have a bit of egg left over after making two pieces of French Toast. One egg is never enough to coat two pieces of bread and two eggs is always too much. 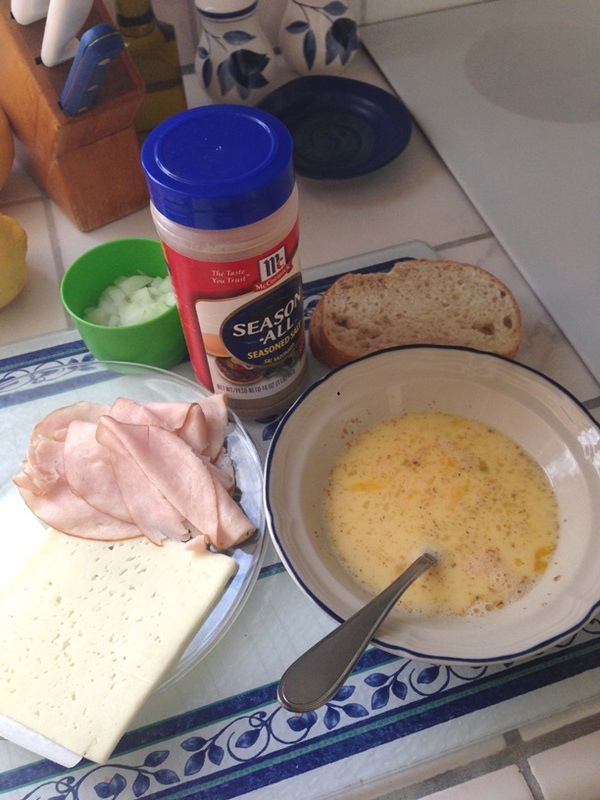 I cooked up the rest of the egg mixture and pan fried some lunch meat for the sandwich. Put some butter in a pan and turn on the heat. Scramble the two eggs adding the season salt and a splash of milk. Dip the bread in the egg mixture. (Here is where you decide if you like a lot of egg on your bread or not. I usually just dip the bread quick.) When the pan is good and hot add the egg coated bread to the pan and proceed to cook as you would French Toast. I like my French Toast browned. 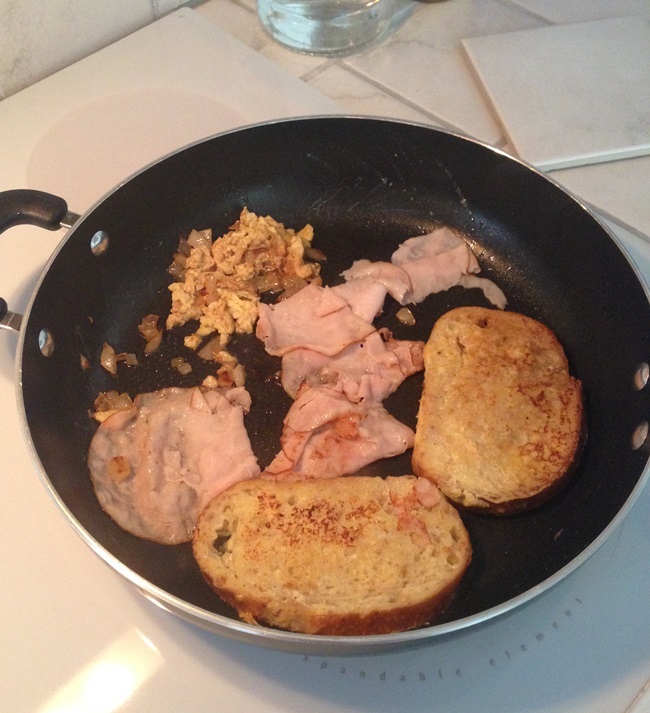 If you have room in the same pan as the bread you can cook any remaining egg you may have, along with the lunch meat. Or you can use another pan to cook the remaining egg and the lunch meat. At one point you might want to put the cheese on the bread so it can start to melt . . . again . . . it all depends on whether you want melted cheese. Once the toast is cooked to your liking, the extra egg is cooked, and the lunch meat is browned you can assemble the sandwich. I added some raw onions on my sandwich. This was so good I am finding my mouth water as I am typing this up. I can see myself having this again in the next couple of days! Probably not a new thing to some – savory French Toast – but it was a complete and delicious accident to me! What do you think? I am aware that lunch meat is not one of the healthiest of things to be eating. But I LOVE sandwiches. I also love that my husband will eat a sandwich that I make and send to work with him instead of eating out every day. He does eat lunch out on occasion. A sandwich with lunch meat is healthier than what he eats when he eats out. But this post is not REALLY about lunch meat. It is about prices. It is about paying attention. It is about packaging. It is about knowing what you are buying. In my opinion, food manufacturers are tricky. I was in the store not too long ago buying lunch meat. I prefer the meat that my husband gets at Costco, but he has not made that trip in a bit so I am buying lunch meat from the grocery store. It is a good idea to look at the per ounce prices on things. I looked at the package of lunch meat that I normally buy and decided upon a really quick glance that there was another brand that was less expensive and to my delight tastier. 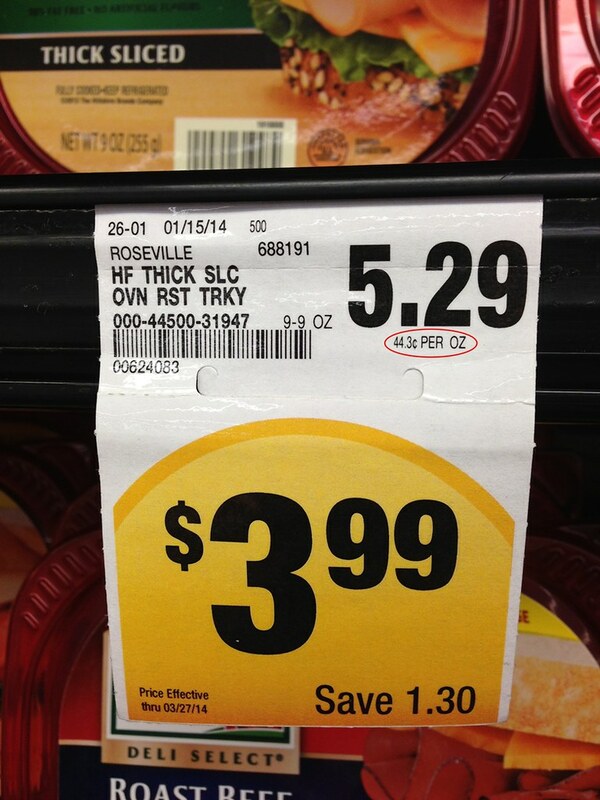 I was trying to decide which turkey to buy when I saw the roast beef. My hubby gets turkey ALL THE TIME so I thought, “Oh, I will get the roast beef instead. It is the same price.” But as I picked it up I happened to look at the per ounce price on this brand. I didn’t really expect it to be different, in fact I was confused at first because the package was the same, but there was a 12¢ difference. That is when I look at the weight. The WEIGHT was not the same. The turkey was 9 oz and the roast beef was 7 oz. So even though I would be paying the same amount I would be getting two ounces less. 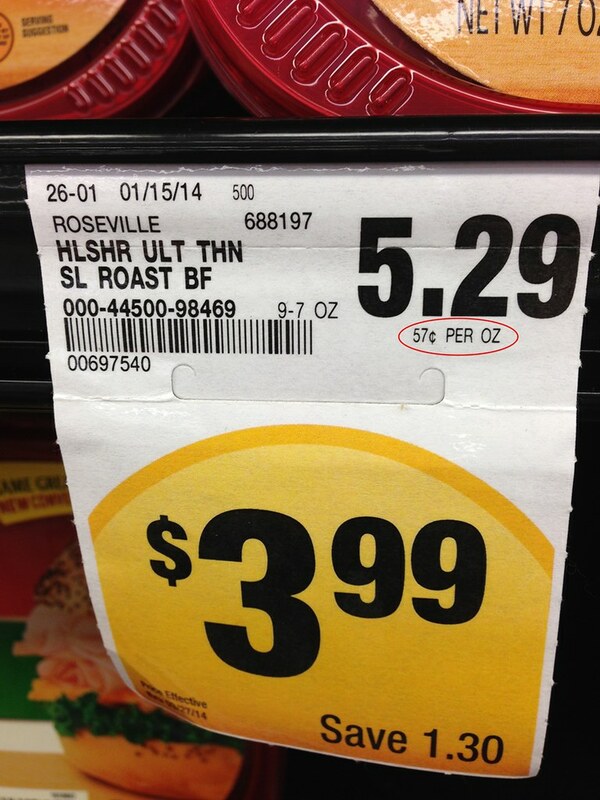 I don’t know for certain, but I can imagine that I bought this roast beef before. And I bet that I didn’t even notice the weight difference because the package is the same. Exactly the same. So I bet I didn’t even look at the weight because I thought I was getting the same amount of roast beef as I was turkey for the same price. Now, really, if you want roast beef you are probably going to get it. I just think this is tricky. But — yes, it is clearly labeled as different amounts. I just really like that little “price per unit” amount the put on shelf labels. It really helps. Sometimes things LOOK more expensive because the price on the package might be more, but when you really look and compare it could be that the price of what you are buying is really less. I say “price per unit” because sometimes it is ounce and sometimes it is something else, just depends on what you are buying. So I use this information often. But usually between different brands. It is so small and so many of us are in a hurry — especially at the grocery store — I thought I would share. Actually, I thought I would share because this annoyed me. I felt like I would have been duped if I bought the roast beef. And that really would have just been ME . . . I mean I was the one that thought they were the same size for the same price. I know about the “price per . . .” information, but since the packages are the same I ASSUMED (uh-oh!) 🙂 Since I was comparing lunch meat prices I happened to look at the per ounce price on this brand. I was shocked and annoyed. I have also been paying attention to the prices at the store near my Nia class because although it is really convenient, I think it might be more expensive than the one closer to my house. So I have been really looking close! Anyway . . . I guess I am just saying if you have the time and the inkling – really LOOK at what you are buying and use the “price per unit” portion of the shelf label! Do you compare prices when you shop? Do you stick to your particular brands? Are you like me and you just really want to get in the store and get out?